The Right Hand Lovers was a punk band formed by me and Paul Whitehouse in Norwich in 1977, where we first met. The band was made up of students from UEA, including Dave Cummings on guitar. The band was fairly short lived and we all went on to do other things. Dave became one of Lloyd Cole’s Commotions for a while and then joined Del Amitri, before, like Paul and I before him, jacking in the music business for comedy. Dave started writing with us on The Fast Show in the 90s and most recently worked with Paul on Nurse. And we have recruited the brilliant David Arnold to play keyboards, do the string arrangements and to produce. I’ve known David for years, ever since I borrowed him from the world of James Bond scores and got him to do the theme tune for my remake of Randall and Hopkirk Deceased back in 2000. I most recently worked with him on Jekyll & Hyde… and he also appeared in the Brian Pern TV series, playing himself. 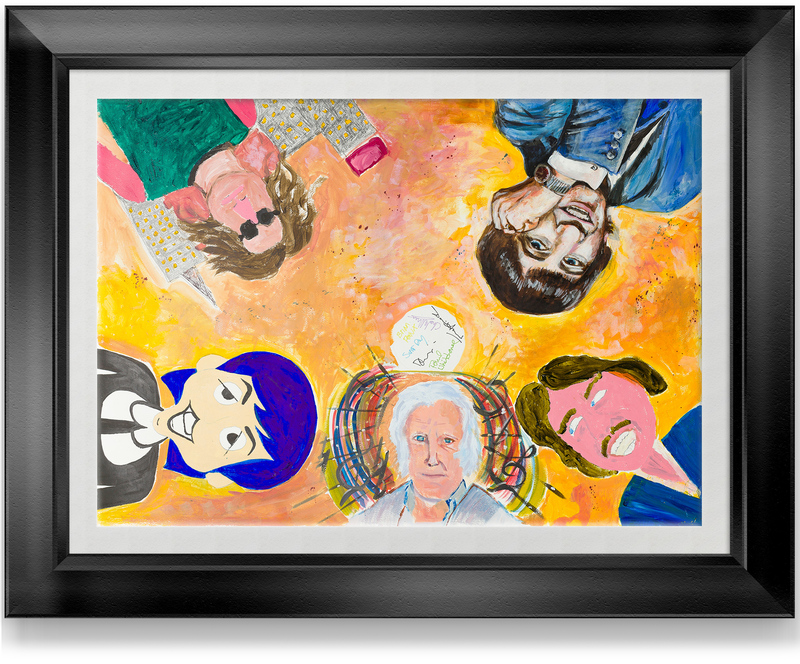 As I was trying to think of a fitting subject for a painting that four, and eventually, five, people could to do together, the idea of The Beatles jumped out at me. Why not each of us pick a Beatle? It seemed a fitting way for this project to come full circle. And, as George Martin – often called the fifth Beatle – had recently died, it seemed apt that David Arnold, who knew George well, would paint him as a tribute. So it was that we all approached the painting with a variety of styles – but isn’t that mix what makes a pop group great? Simon/Brian Pern chose John Lennon, Paul chose Paul McCartney, Dave took George Harrison and I had a go at Ringo Starr.